Top Reasons To Use Tiki Bar Plans To Build Your Bar! You are here: Home / Blog / Top Reasons To Use Tiki Bar Plans To Build Your Bar! Build this outdoor tiki bar with tiki bar plans you can download. There is something special about going to Hawaii or Mexico and having a beer or a blender drink while sitting at a tiki bar. I’m sure that being on vacation, in a warm climate also makes it feel very cool. Once thing for sure, you don’t have to wait to go on vacation to have a drink at a tiki bar. If you are lucky you might have a local hangout with one, but you can also buy or make your own. Knowing these top 5 reasons to build your own build your own tiki bar with plans, will provide good information to decide if this is something you want to do. It’s also good to understand why building your own tiki bar is better and makes so much sense. Here are the top 5 reasons why you should consider building your own instead of purchasing one that is already built for you. Save money – The top reason to build your own tiki bar is to save money. Buying a proper tiki hut can be very expensive. By building your own you can purchase all of the materials yourself and make sure it lines up with your budget. To save money now, you can decide to hold off on some details and finish them later. Like shelves behind the bar. Advice from an expert – if you have a good set of plans, you are getting the experience of someone who has built them before and using his knowledge to help you create a great bar. Customize – Another big reason to build your own is that you can customize it to make it the way you want it. If you want the bar a little longer or wider you can modify the plans. This isn’t something you can do when purchasing a tiki bar. You have to go with what they have in stock. Perfect location – Since you can customize your bar, you can have it fit into the perfect place by adjusting your plans. It’s fun and rewarding – It can be a lot fun building your own tiki bar. It does take some time to build it, but it will feel great having your friends over for a drink while sitting at the tiki bar you built. 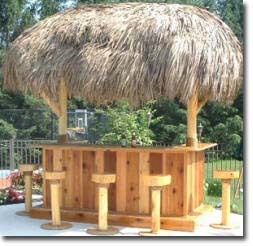 So if you are thinking about getting a tiki bar, I recommend you look at getting a set of plans and building your own. Plans can be downloaded from the Internet and they will give you a good idea of what you can do. You can now find Tiki Kev plans on the Etsy site.